HP has held its lead in the EMEA PC market, but as shipments continue to slump Lenovo is the only manufacturer defying the trend, according to the latest quarterly figures from analyst house IDC. Its Europe, Middle East and Africa Quarterly PC Tracker for the second quarter of 2013 shows HP holding a 19% market share with 3.72 million units shipped, but this was 23% down on the same period in 2012. Lenovo has now pushed past Acer into second place, with 2.62 million shipments and 13.4% share. It was the only manufacturer to increase its business, up by 19% year-on-year. IDC attributes the company's success to extending its range of products and finding more space on the retail shelves. While it's found most of its growth in the consumer sector it is also making ground in the business PC market. The report says HP has lost ground partly due to a stock reduction, but that there have been signs of recovery towards the end of the quarter, and that its commercial desktop business remains more solid than its consumer sales. Total shipments for the region in the quarter were 19.60 million, down from 25.19 million a year before. There are no surprises in the analysis that the market has been hit by the growing demand for tablets, and that new form factors have not yet provided a new stimulus for the PC market. "The transition to Windows 8 and touch-enabled devices remained slow, and the high cost of those platforms continue to inhibit more robust growth," IDC says. It makes a point, however, that the decline for the UK was not as sharp as for the rest of Western Europe. The figures reflect the global trends identified by both IDC and Gartner earlier this month, although on a worldwide scale Lenovo has already overtaken HP. 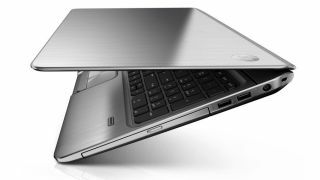 Take a look at our round-up of the top 10 business laptops.